But though throughout the whole of Western Europe and North Africa the Roman imperial system had collapsed, though credit had vanished, luxury production had ceased and money was hidden, though creditors were going unpaid and slaves masterless, the tradition of the Caesars was still being carried on in Constantinople. We have already had occasion to mention as two outstanding figures among the late Caesars, Diocletian (284) and Constantine the Great (312), and it was to the latter of these that the world owes the setting up of a fresh imperial centre at Constantinople. Very early during the imperial period the unsuitability of the position of Rome as a world capital, due to the Roman failure to use the sea, was felt. 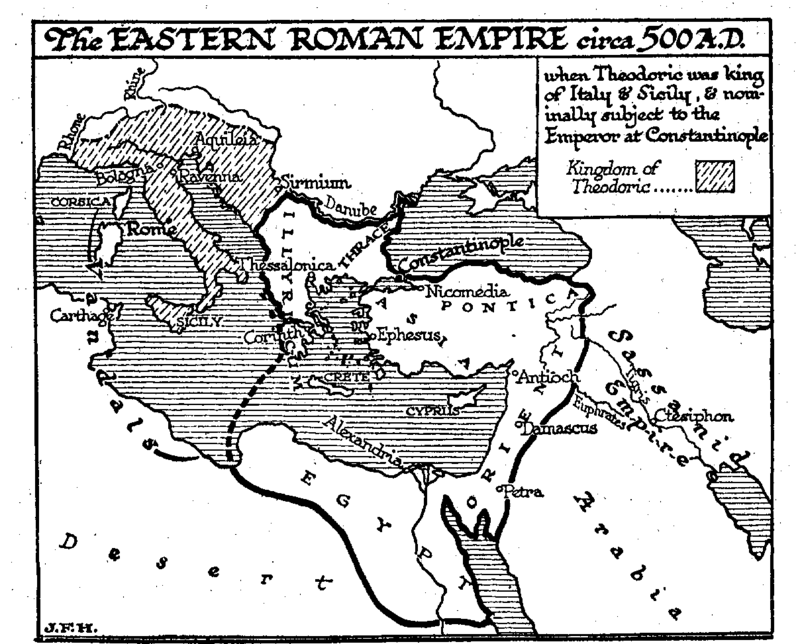 Figure 488: Map — The Eastern Roman Empire circa 500 A.D. The Eastern Roman Empire circa 500 A.D., when Theodoric was king of Italy and Sicily, and nominally subject to the Emperor at Constantinople. The destruction of Carthage and Corinth had killed the shipping of the main Mediterranean sea-routes. For a people who did not use the sea properly, having the administrative centre at Rome meant that every legion, every draft of officials, every order, had to travel northward for half the length of Italy before it could turn east or west. Consequently nearly all the more capable emperors set up their headquarters at some subordinate centre in a more convenient position. Sirmium (on the River Save), Milan, Lyons, and Nicomedia (in Bithynia) were, among such supplementary capitals. For a time under Diocletian, Durazzo was the imperial capital. Ravenna, near the head of the Adriatic, was the capital of the last Roman emperors in the time of Alaric and Stilicho. It was Constantine the Great who determined upon the permanent transfer of the centre of imperial power to the Bosphorus. We have already noted the existence of the city of Byzantium, which Constantine chose to develop into his new capital. It played a part in the story of the intricate Histitaeus (Chap. XXI, sec 4); it repulsed Philip of Macedon (Chap. XXIII, sec 3). If the reader will examine its position, he will see that in the hands of a line of capable emperors, and as the centre of a people with some solidarity and spirit and seacraft (neither of which things were vouchsafed to it), it was extraordinarily well placed. Its galleys could have penetrated up the rivers to the heart of Russia and outflanked every barbarian advance. It commanded practicable trade routes to the east, and it was within a reasonable striking distance of Mesopotamia, Egypt, Greece, and all the more prosperous and civilized regions of the world at that period. And even under the rule of a series of inept monarchs and under demoralized social conditions, the remains of the Roman Empire centring at Constantinople held out for nearly a thousand years. It was the manifest intention of Constantine the Great that Constantinople should be the centre of an undivided empire. But having regard to the methods of travel and transport available at the time, the geographical conditions of Europe and Western Asia do not point to any one necessary centre of government. If Rome faced westward instead of eastward, and so failed to reach out beyond the Euphrates, Constantinople on the other hand was hopelessly remote from Gaul. The enfeebled Mediterranean civilization, after a certain struggle for Italy, did in fact let go of the west altogether and concentrated upon what were practically the central vestiges, the stump, of the empire of Alexander. The Greek language resumed its sway, which had never been very seriously undermined by the official use of Latin. This «Eastern» or Byzantine Empire is generally spoken of as if it were a continuation of the Roman tradition. It is really far more like a resumption of Alexander’s. 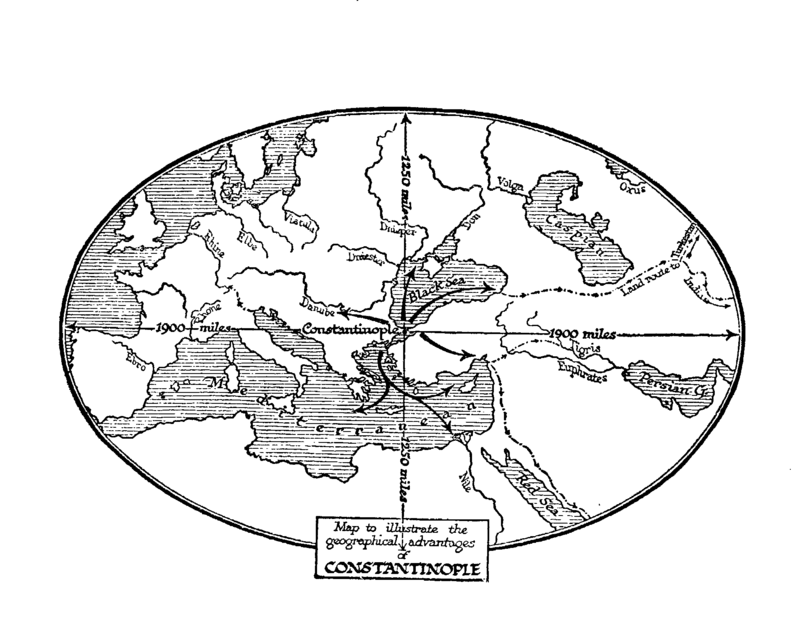 A map to illustrate the geographical advantages of Constantinople. The Latin language had not the intellectual vigour behind it, it had not the literature and the science, to make it a necessity to intelligent men and so to maintain an ascendancy over the Greek. For no language, whatever officialdom may do, can impose itself in competition with another that can offer the advantages of a great literature or encyclopaedic information. Aggressive languages must bring gifts, and the gifts of Greek were incomparably greater than the gifts of Latin. The Eastern Empire was from the beginnings of its separation Greek speaking, and a continuation, though a degenerate continuation, of the Hellenic tradition. Its intellectual centre was no longer in Greece, but Alexandria. Its mentality was no longer the mentality of free-minded plain-speaking citizens, of the Stagirite Aristotle and the Greek Plato; its mentality was the mentality of the pedants and of men politically impotent; its philosophy was a pompous evasion of real things, and its scientific impulse was dead. Nevertheless, it was Hellenic and not Latin. The Roman had come, and he had gone again. Indeed he had gone very extensively from the west also. By the sixth century A.D. the populations of Europe and North Africa had been stirred up like sediment. When presently in the seventh and eighth centuries the sediment begins to settle down again and populations begin to take on a definite localized character, the Roman is only to be found by name in the region about Rome. Over large parts of his Western empire we find changed and changing modifications of his Latin speech; in Gaul, where the Frank is learning a Gallic form of Latin and evolving French in the process; in Italy, where, under the influence of Teutonic invaders, the Lombards and Goths, Latin is being modified into various Italian dialects; in Spain and Portugal, where it is becoming Spanish and Portuguese. The mental Latinity of the languages in these regions serves to remind us of the numerical unimportance of the various Frankish, Vandal, Avar, Gothic, and the like German-speaking invaders, and serves to justify our statement that what happened to the Western empire was not so much conquest and the replacement of one population by another as a political and social revolution. The district of Valais in South Switzerland also retained a fundamentally Latin speech and so did the Canton Grisons; and, what is more curious and interesting, is that in Dacia and Moesia Inferior, large parts of which to the north of the Danube became the modern Roumania. (= Romania), although these regions were added late to the empire and lost soon, the Latin speech also remained. In Britain Latin was practically wiped out by the conquering Anglo-Saxons, from among whose various dialects the root stock of English presently grew. But while the smashing of the Roman social and political structure was thus complete, while in the east it was thrown off by the older and stronger Hellenic tradition, and while in the west it was broken up into fragments that began to take on a new and separate life of their own, there was one thing that did not perish, ‘but grew, and that was the tradition of the world empire of Rome and of the supremacy of the Caesars. When the reality was destroyed, the legend had freedom to expand. Removed from the possibility of verification, the idea of a serene and splendid Roman world-supremacy grew up in the imagination of mankind, and still holds it to this day. Ever since the time of Alexander, human thought has been haunted by the possible political unity of the race. All the sturdy chiefs and leaders and kings of the barbarians, who raided through the prostrate but vast disorder of the decayed empire, were capable of conceiving of some mighty king of kings greater than themselves and giving a real law for all men, and they were ready to believe that elsewhere in space and time, and capable of returning presently to resume his supremacy, Caesar had been such a king of kings. Far above their own titles, therefore, they esteemed and. envied the title of Caesar. The international history of Europe from this time henceforth is largely the story of kings and adventurers setting up to be Caesar and Imperator (Emperor). We shall tell of some of them in their places. So universal did this «Caesaring» become, that the Great War of 1914-18 mowed down no fewer than four Caesars, the German Kaiser (= Caesar), the Austrian Kaiser, the Tsar (= Caesar) of Russia, and that fantastic figure, the Tsar of Bulgaria. The French «Imperator» (Napoleon III) had already fallen in 1871. There is now (1920) no one left in the world to carry on the Imperial title or the tradition of Divus Caesar except the Turkish Sultan and the British monarch. The former commemorates his lordship over Constantinople as Kaisar-i-Roum; the latter is called the Caesar of India (a country no real Caesar ever looked upon), Kaisar-i-Hind.